They are the early members of class Gastropoda. Most of them live in marine environment. They have a well-developed shell. The shell is very useful for marine forms for protection from predation. Since marine environment is rich in calcium carbonate (CaCO₃) the main component in Prosobranch shell is CaCO₃ . Their protein content is low. So their shell is very hard. Prosobranchs have one pair of long tentacles. This is the main distinguishing feature between prosobranchs and pulmonates. Eyes are located on top of these tentacles. Most of them have an operculum to seal the aperture of their shell. But they have a small gap for air exchange. Spine patterns on this cover are used for species identification. They are dioecious animals (sexes are separate). All pulmonates are terrestrial. They have two pairs of tentacles. One pair is long and has eyes on top or at the base of them. The other pair is short and has chemoreceptors. Their shell is mainly composed of proteins and they lack CaCO₃. So their shells are very fragile. Most of them are hermaphrodites (both sexes seen in the same individual). About three quarters of Gastropod species belong to subclass Pulmonata. Slugs and semi slugs are also included in this subclass. • Snails have photo sensors in eyes and heat sensors on tentacles. • Only Acavus genus lays eggs with shells. Other species lay eggs without shells. • Acavus is a hermaphrodite genus but do not use their own sperms for fertilize their eggs. They exchange their sperms. This allows more genetic variation to occur than fertilizing their eggs from their own sperms. Sperms exits from the opening near the right tentacle. • Differences of the reproductive system can be used for species identification. • Terrestrial snails eat leaves, mosses, fungus rotting fruits etc. • Marine and other aquatic snails eat planktons and sea plants such as sea grasses. • Terrestrial snails can be seen mostly in rainy seasons. They are highly abundant in wet zone. They cannot be seen in hot day times because they can be subjected to desiccation. They also cannot bare high light intensities. • There are about 75 000 of land snail species present in the world. 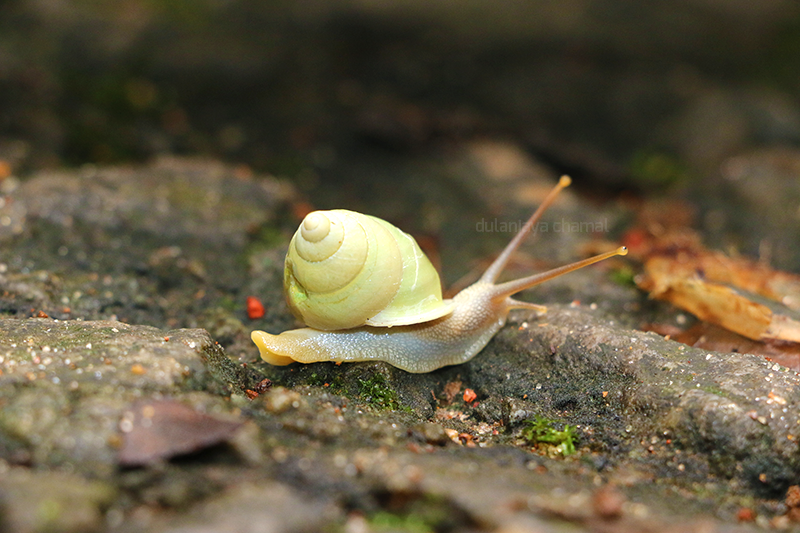 • Sri Lanka has 246 land snail species. Among them 218 species are endemic. The endemism percentage is about 80%. - Acavus – 3 species present. They are considered as living fossils because members from this genus were found in archaeological sites such as Pahiyangala which gives evidence their presence in pre historic times. Acavus is used as food and their juice is used for medical purposes. Acavus have attractive colours. It is a disadvantage for the survival of this species. Because people collect their shells as ornaments. - Oligospira -3 species present. When food is scares they form a layer and hibernate. - Rawana – 1 species present. It is Rawana politissima which was considered early as point endemic species. But it is found in many places in hill areas. They cannot be seen below 800m altitudes. - Rathnadvipia – 2 species present. Both Rawana and Rathnadvipia contain semi slugs. Snails in this species have a shape like Sri Lanka. - Corilla genus – 5 species in the world. 4 species are endemic to Sri Lanka. One species is shared with Sri Lanka and India. This is an evidence to prove that Sri Lanka and India were connected together in the past. • Acavus can be seen on a high position of a tree. They can be seen as groups with 5-10 individuals. Most other species lives on low heights of trees. • Size, shape of the shell, body colour can be used for species identification. Colour of the shell is not a good distinguishing character because it can lead for misidentification. Eg: Bedomia albizonata is an endemic species. Its shell is green colour due to a symbiotic relationship with algae. But when the snail dies the shell become white colour because of the breakdown of symbiotic relationship. Sometimes some shells become green colour due to deposition of mosses. So shell colour is not a valid distinguishing feature of snails. Lip of the shells is also a distinguishing feature. But it also varies sometimes. Lip is absent in juvenile forms. It is visible well only in the adult forms. Lip colour can be varied according to their diet, climate and environmental condition. • Some snails are considered as invasive species because they are introduced to some environments by human activities. These invasive ones cause problems to native species. There are about 18 such snail species in Sri Lanka which are considered as pests. Many of them are slugs. They mainly live in hill country in agricultural areas.